I'm constantly amazed at the significant historical stories I hear that took place in Georgia...the Wren's Nest being one of the places to provide quite a few. 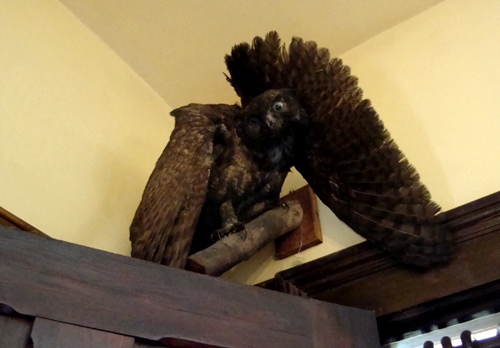 The owl in the above photo was a gift to Joel Chandler Harris, author of the Brer Rabbit tales and the first Georgian to be nationally recognized as an author of children's stories, from President Teddy Roosevelt. Interestingly, Harris turned down the President's initial attempts to extend the hand of friendship. Well, Presidents being the persistent type that they often are, Roosevelt was not one to take no for an answer. As it worked out, the two of them, Harris and Roosevelt, became quite good friends...evident by the photos and other artifacts on display at the Wren's Nest, including the owl overlooking the music room. Personally, I'm very much looking forward to a return visit to the Wren's Nest for their Saturday afternoon storytelling. Depending on the weather, storytelling may take place inside the house (near the porch where Harris wrote many of the stories) or in the garden.